As you probably know, lots of people visit our garden. They enjoy wandering through and admiring our efforts. It’s an important aspect of our garden that we are open and welcoming and it’s how many of us first got involved. Unfortunately some of our visitors don’t just look, some are taking food that isn’t theirs to take. For a while we’ve been hearing reports ranging from the loss of an occasional eggplant through to whole crops being taken from personal plots just as they’re ready to pick. We’ve recently tried putting up some signs but it hasn’t helped. This is very sad, disappointing and frustrating for everyone but ESPECIALLY for those committed people who lose their food! As it’s happening quite a bit, we must do something about it or we risk being an open, welcoming garden with lots of unhappy gardeners. 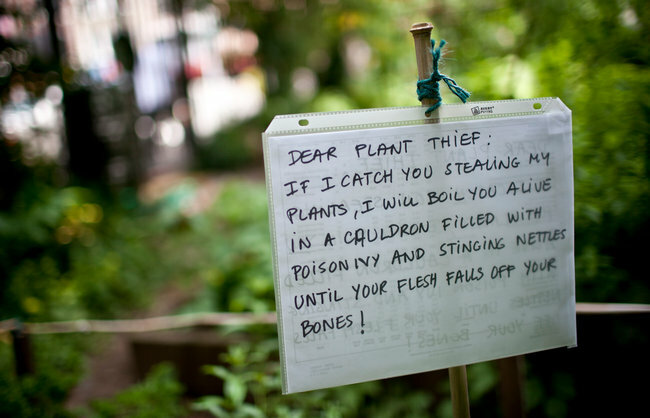 "A gardener's recipe for vengeance at the Sixth Street and Avenue B Community Garden in Manhattan." Last week, at our monthly meeting, nine members of our organising committee made this problem our highest priority. There was vigorous discussion about lots of different options and we agreed unanimously on a plan. For 3 months we’re going to put locks on the garden gates. This won’t stop someone who is determined to take food but it should send a clear message and deter most people. We’ll take this time to make some proper signage and work out what else we can do to combat this bad behaviour. Please share any ideas you have about this. We’ll set a new combination for the shed, wheelbarrows and gate and lock up for the first time from the end of the next Garden & Gather (Sunday 27th April 11am -3pm). The other gate will have a keyed lock for people who have trouble using the combination lock. All our combination locks (shed, wheelbarrows, gate) will have the same combination. How do I get the new combination or a key? To get the new combination (or to get a key) you’ll need to come along to the next Garden & Gather (Sunday 27th April 11am -3pm). Like I said before, this is an unwanted and sad turn of events but we feel we need to take this action to address the important issue. If you have anything to say about it, please feel free to email us (grow.eat.moreland@gmail.com) or bring it up down at the garden with a member of the organising committee.